Submitted by Alexander Briones on Aug. 17, 2017. Be it for inspired practice or for performing on stage, these market favorite modeling amps for guitar are worth your time and investment. We have decided to sift through what's available to present you with the best modeling amps for guitar, divided into three price brackets that fit the average budget. In addtion, we've included important features and noteworthy feedback from both experts and users, to give you a good overview of how well each one is received. We've also included tips and considerations that can help you narrow down the list further to those that match your needs. While most modeling guitar amps in the sub $1000 price range are aimed at beginners to intermediate players, there are some that are more than ready to take on the stage, so do check them out if you're looking for a road worthy rig. 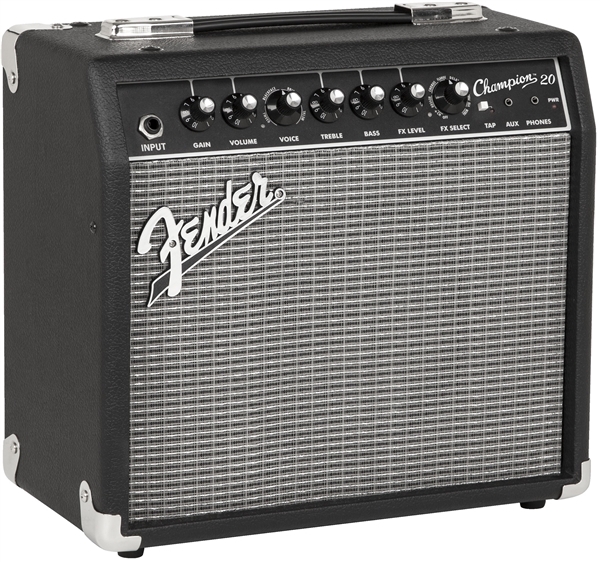 The Fender Champion 20 is a combo guitar amp that offers the flexibility and convenience of modern amp modeling technology, in a very intuitive and affordable package. It houses a 20W amp, an 8" speaker, and features modern amp modeling that's easily controlled via a single voice knob. With you can quickly dial in the sound of 12 amplifiers, including classic Fender tones, British crunch and even high gain metal. If that's not enough, it also comes with built-in effects that include reverb, delay, chorus, tremolo, Vibratone, auto-wah and more . The effects section is controlled by an FX selector knob, a level knob, and a Tap button for manually setting the timings of some of its effects. Wrapping it all up is Fender's distinct "Blackface" styling, which gives this modern amp a classic appeal. The Fender Champion 20 is a true champion in the entry-level market, beating the competition with its value for money, flexibility and simplicity. While its versatility was commended, many were still impressed by its clean tones, which is not surprising since this is a Fender designed amp. While many consider it as the best beginner guitar amp, it doesn't stop experts from enjoying the amp themselves, as seen on many reviews. There were a few who found the effects section a bit lacking, while others were looking for a bit more control over the amp models. Still, even those who complained are impressed with its overall performance considering its price. If you are looking for good quality and affordable modeling amplifier with simplistic controls, then the Fender Champion 20 is for you. 95 out of 100. Incorporating 425+ ratings and reviews. 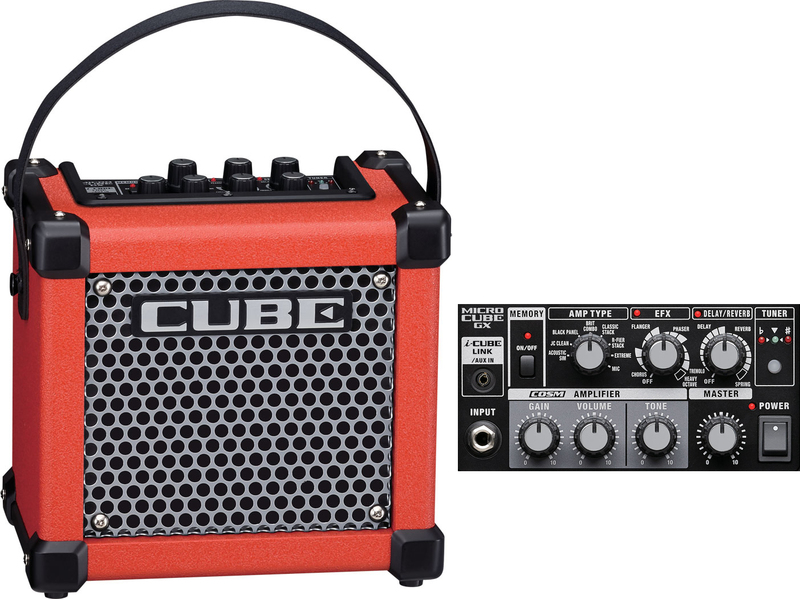 The Roland Micro Cube GX3 is a portable 6-pound combo amplifier with the sound of 8 different amplifiers, 8 digital effects, and powers all these with 6 x AA batteries. This means that you can conjure different amp and effect tones virtually anywhere, as long as you have enough batteries. This includes familiar clean, crunch and rectifier tones, and it also includes a dedicated acoustic amplifier model for those who prefer to use their acoustic-electric guitar. Since it is designed to be portable, it doesn't have much power with its 3W rating and 5" speaker, but it is loud enough for bedroom or outdoor jamming. Other practice friendly features include Roland's i-Cube Link port for connecting with iOS devices, and a headphones out for quiet practice. I have to agree with many who describe the Roland Micro Cube GX as the best portable modeling amplifier, thanks to its battery power option and lightweight design. Ease of use and amp modeling sound quality are often mentioned in a positive light, even impressing experienced players. Paul White from Sound On Sound said, "For busking, garden jams or open mic nights, the MicroCube GX delivers the goods in style". On the flipside, the effects section received a few thumbs down. There are a few users who expected a bit more power from the amp, but given its portability, it is a necessary compromise. The Roland Micro Cube GX is especially designed for guitarists who are always on the go, it is easily the best portable modeling amplifier. Thanks to Blacksta's ID:Core series, it is now possible for guitarists to have an affordable true stereo modeling amplifier. To be specific, the ID:Core 20 V2 takes a spot on this list with its versatility and simplicity, while keeping Blackstar's brand of modern aesthetics and tones. At the heart of this amp is the company's patented ISF (Infinite Shape Feature), which works with the built-in six amp voices to let you go from American clean to British rock to Blackstar's acclaimed high gain tones. It also comes with a myriad of effects that include multiple modulation, reverb and delays, all of which take advantage of the amp's stereo 2 x 10" amplifier and 2 x 5" speaker setup. Finally, it comes with a USB port for direct recording into computers, adding even more value to its already impressive spec sheet. Although the 2nd iteration of the ID:Core 20 is a relatively recent release, more and more positive reviews are pouring in. Many of which point to its versatility and nice stereo tones as their favorite features. Users often compare it to other amps in the same price range, and find the stereo speakers to be a very good deal.. As expected, high gain tones are preferred by most users, but some also reported enjoying its half cranked tones. Thankfully, there aren't enough noteworthy negative comments to mention. The Blackstar ID:Core Stereo 20 V2 is a high-gain worthy modeling amplifier that's great for practice and inspired jams. Do check it out! The Vox VT40X brings with it an interesting combination of tube and digital sound processing technologies, resulting in a hybrid modeling amp with a 12AX7 preamp at its core. The inclusion of a 12AX7 tube adds to the realism of the 11 built in amp models, just remember that this tube will require maintenance and replacement in time. 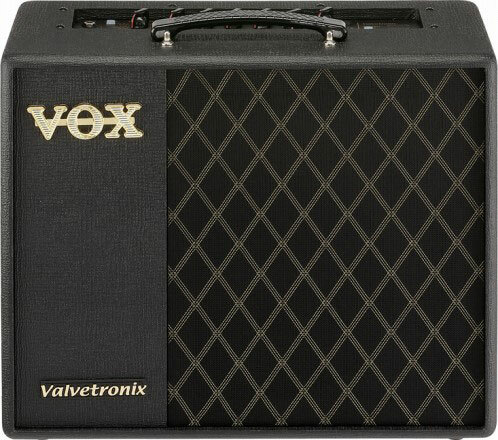 It starts off with Vox' signature chime'y clean, and can go as far up as double rectifier metal tones. The amp models work together with 13 digital effects that you can configure to your liking and store in its 33 presets, which by default comes with many artist inspired tones. At 40 watts, this combo amplifier has enough punch for band practice, while the power attenuator control lets you crank the amp at lower volumes. There's also a headphones out in case you want quiet practice. Most of the high ratings are from users who are impressed with the amp's overall tone, which they commend as a big upgrade from their other modeling amplifiers. One user put it aptly, saying that many of the amp models are "spot on", which is impressive considering the amp's price tag. A lot of users reported using the Vox VT40X in both practice and small venue performances with great results. Even Music Radar was impressed enough to give it 5 stars, and said that "The VT40X's sounds have really improved with more focus and detail". Unfortunately, Vox can't please everybody, as evidenced by a few users who found the sound to be a bit on the muddy side. One user reported getting better results after he replaced the speaker and the 12AX7 tube. The Vox VT40X amplifier is ideal for guitarists who want to experience the best of both worlds - tube tones and digital amp modeling - at a more reasonable price point. 90 out of 100. Incorporating 300+ ratings and reviews. 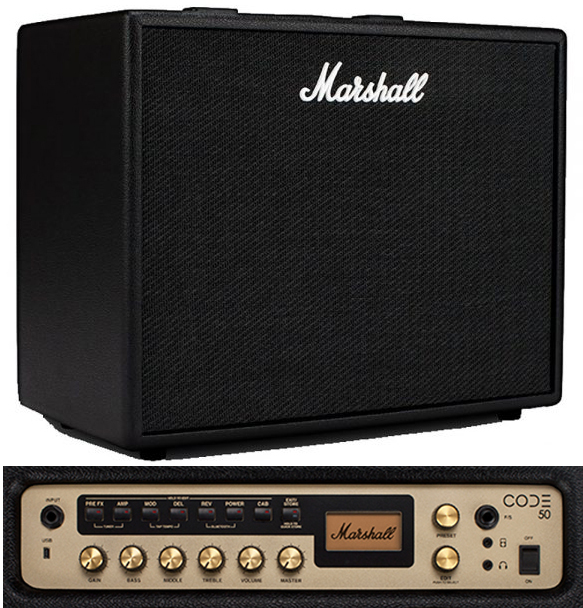 Thanks to popular guitarists like Slash, Marshall continues to be the backline amp of choice for many guitarists. And while they are widely known for their tube driven amps, the company have embraced digital modeling technology with amps like the Code50, which continues to get favorable reviews. Instead of going the straightforward route, Marshall decided to provide in-depth control over the sound with 14 different preamp models, 4 poweramp models and 8 speaker cabs. This means that you can mix and match virtual components as you find your preferred tone. As expected, the amp models include many of Marshall's own classic amps, but also extend to clean and high gain tones. There are also a wide array of effects, that's controllable via Bluetooth on your iOS device - so you get a full guitar rig in combo amp package. Finally the Marshall Code50 has 50 Watts of power and a 12" speaker, which can be quiet for practice, and loud enough for small venue performances. Great and excellent are two words that summarize how many reviewers feel about the amp. Many are satisfied with the amp's deep control settings, and appreciate the convenience of Bluetooth connectivity. But most of the thumbs up are from users who are impressed with the many Marshall tones that can be achieved. Even older players who prefer real tubes are glad that they took a chance with this modern amp. Still, there are some who want something that's easier to configure, and a few have qualms with some of the amp presets. After reviewing the amp, Guitar Player writer Art Thompson said, "it’s clear that Marshall has gone to great lengths to ensure you’ll be impressed by what CODE has to offer". With its big brand backing and so many nice features, I have to agree with what most users say, that the Marshall Code50 is the best value modeling amplifier today. Definitely get it if you're a fan of Marshall tones. 94 out of 100. Incorporating 325+ ratings and reviews. Don't underestimate the Yamaha's THR10X's small profile, because this 10W combo amplifier with stereo 3.15" speakers is more than capable of handling high gain tones, with 5 different metal flavors of metal classic to modern. It easily stands out from other amps with its desktop friendly profile, which makes it ideal for practice and recording (via its USB output). In addition to the high gain amp models, the THR10X also features a bass amp model, for plugging in your electric bass, an acoustic guitar amp model for acoustic-electric guitars and there's even flat response amp model for plugging in other gear. Essential modulation and reverb/delay effects are also available, along with 3-band EQ for tone shaping. Finally, the Yamaha THR10X amp can run on battery power for true play anywhere portability. The Yamaha THR10X continues to get rave reviews for its great combination of desktop-friendly profile and high-gain tones. Even pros like Ola Englund got good sounding heavy tones out of its small speakers, and even better when recorded direct to his computer. And it's not just limited to metal, because many were happy that they got decent sounds out of its acoustic amp model. There aren't that many complaints, but I do agree with the minority that wanted the price to be lower, especially when considering that you can get louder and bigger amps in the same price range. Guitar World had a lot of nice things to say as well, and I quote: "If you’re looking for a quick, easy way to get a huge variety of sounds that you can take pretty much anywhere, the THR10C and THR10X are unbeatable bargains for classic and metal guitarists, respectively." Note that there are two other versions available, the standard THR10, and the THR10C which leans towards more classic rock / boutique amp tones. If your'e looking for a tabletop amplifier with amp modeling flexibility and recording, then check out the Yamaha THR10X. 91 out of 100. Incorporating 500+ ratings and reviews. Line 6 just recently released the 5th generation of their Spider amp line, interestingly the Spider Jam (which was launched along side 3rd gen Spider amps) continues to be a staple in the amp modeling market - many years after its first release. And its age is the main reason for its limited modeling features, which includes just 12 amps and 7 effects. Still, it continues to be rated highly and in demand, thanks to its versatility and good hardware specs, which include having a 75W amplifier, and a full-range speaker system with a 12" Celestion Speaker and a 2" Tweeter. Speaking of versatility, this amp even comes with a mic input, which makes it behave like a mini-PA system. In addition, it comes with a built-in looper and "jam" functions that's great for practice and one-man-band performances. Note that since this amp is old, it doesn't have a USB output, but the SD card slot makes up for this lack. Reviewers are quick to point out that the Line 6 Spider Jam gives them way more than what they paid for. 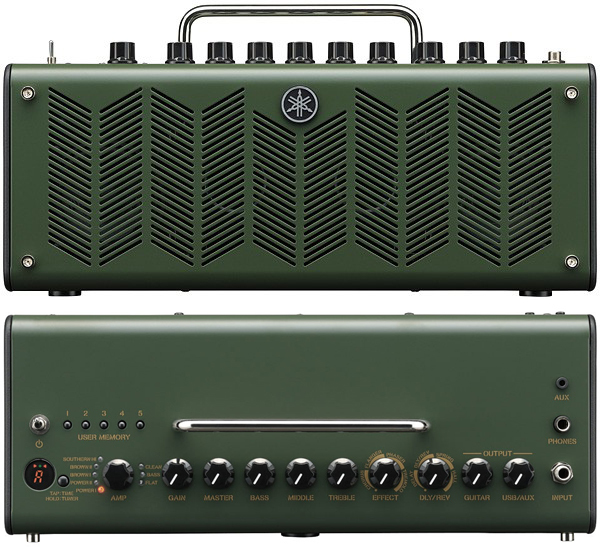 Many describe the amp as a true "band-in-a-box" package, with its looping capability and 100s of built-in song presets. And a lot of users like how the built-in tweeter added to the overall sound quality, which is quite surprising when you consider that this amp is many years old. Ironically, there were a few users who did not like the sound, specifically when using the effects. There were also some who were overwhelmed by its myriad of features, and wished for a simpler interface. All in all, the Spider Jam is a great combo amp to get if you're looking for a versatile modeling amp with mic input. 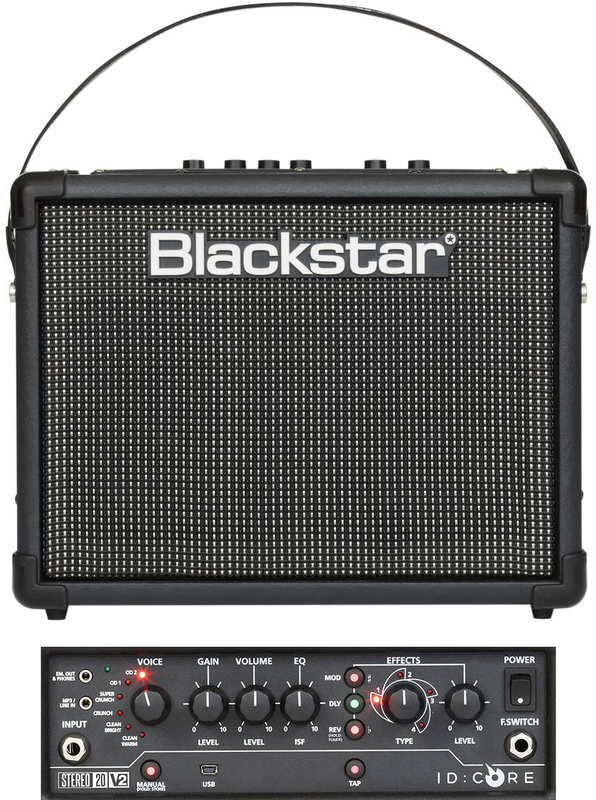 The Blackstar ID:260TVP is a solidstate guitar amplifier that introduces the company's TVP (True Valve Power) technology. Blackstar's ISF (Infinite Shape Feature) by itself is already impressive, because of how it shapes guitar sound to mimic different amp voicings. But the company raised the bar yet again with TVP, which allows you to switch between different virtual tubes to further tweak your sound. This new parameter lets you pick from six popular tubes (EL84, 6V6, EL34, KT66, 6L6 and KT88), which you can mix and match with the amp's Voice, ISF and EQ settings for a wide variety of tones. With 120W of power and two 12" Celestion speakers, this combo amplifier packs quite the punch, and is ready for big venues and stages. Other features include 12 built-in effects to complete your virtual guitar rig, expanded controls, and USB connectivity. Music Radar gave the Blackstar ID:260 TVP top marks, commending it for its genuine "valve sound and fee"l, "huge range of tones" and its USB connection. Most users share the same sentiments, with some saying that they were blown away by the amps overall quality. The deep control that the amps provide for shaping and personalizing tone is also well appreciated. Ironically, this same complex control irked a few users who prefer instant one-button amp models. If you don't mind the price tag and the longer learning curve that the Blackstar ID:260 TVP requires, you will be rewarded with a versatile and great sounding modeling amplifier. The Line 6 DT25-112 is an interesting modeling amplifier that combines tube components, digital modeling and analog circuit switching. Co-designer Reinhold Bogner added a Class A to Class A/B and triode to pentode switching, which works in conjunction with the amp's 12AX7 preamp tube and dual EL84 output tubes, for more control over tube tone nuances. Instead of going the easy multi-amp model and digital control route, the DT25-112 is stripped down with just four main voicings that can be achieved via a switch and some knob tweaking. The four main voicings are described as American clean, English chime, English crunch, and modern high-gain. But it doesn't end there because you can get more voicings by tweaking the parameters to your liking. Finally, this amp's main draw is its compatibility with Line 6' line of POD HD guitar processors, it automatically configures its analog components to match the modeled amps on the processor. Most DT25-112 owners are also Line 6 POD HD owners, and since they get the most out of the amp, they have mostly good things to say. 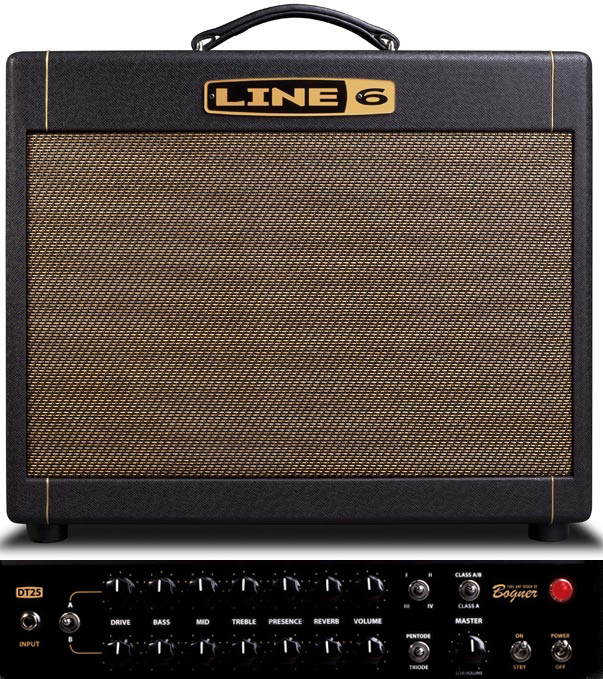 But it's not just for Line 6 fans because other were just as impressed with the amp's realism and overall sound quality. This review conclusion from Sound on Sound reflects much of what the market feels about the amp: "I think the DT25 manages to pull off the trick of looking, sounding and feeling authentic, while combining the flexibility of modelling and switchable power-amp topographies". There were a few users who found the learning curve to be a bit too much, compared to the usual modeling amplifier, but they were satisfied when they finally got the sounds they wanted. 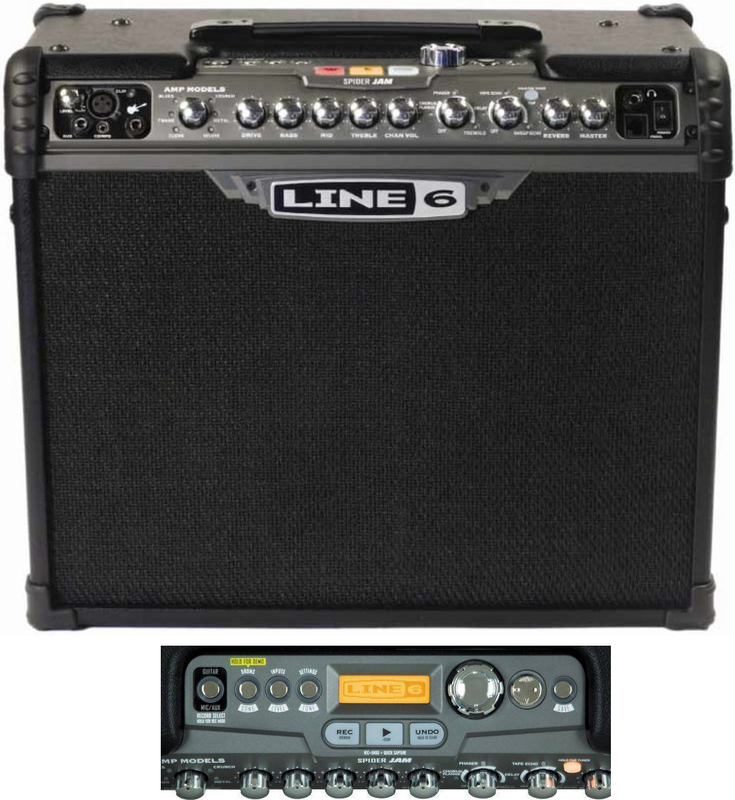 If you are a Line 6 POD HD owner, then the Line 6 DT25-112 is a no-brainer. It will also be a good addition to anyone who wants a versatile tube-driven modeling amplifier. Most modeling amplifiers have solid state components, they are generally regarded to be more affordable, reliable and since they have fewer moving parts, they also requires less maintenance. Some modeling amps feature tube components, and while they can be fragile, they are preferred for their improved tone, feel and sonic detail. Some manufacturers have found a way to vary amp voicing without the use of digital processing, allowing the proliferation of tube amps with analog-based modeling capabilities, however they will not have the same convenience and variety as their digital counterparts. Most modeling amps offer straightforward digital operation, where switching between models are done via buttons or switches. These days, some manufacturers have gone the analog route, opting for a more fluid way of changing the voicing via analog knobs and controls. While it can be tempting to get one with the most number of amp models, more is not always better in this case, especially since you won't normally be using more then 5 amp models in one performance. While not all manufacturers follow a specific power rating standard, the power rating of an amplifier gives you a good idea of how loud it can go. The speaker size also helps in the loudness department, but more than that, it dictates bass definition and clarity. Wider speakers are usually preferred for their extra bass response, but there are many circumstances where smaller speakers and lower power ratings are preferred, specifically for room practice and when portability is your priority. Those who want to get the most out of their money will prefer amps with built-in effects. They allow you to practice and jam without the need to setup effect pedals separately. Don't expect much in terms of quality and control over these built-in effects though, but they can get the job done. Essential effects to look out for include reverb and delay. Generally speaking, the more complex and versatile an amplifier is, the steeper the learning curve. This is especially true of analog modeling amps where you have to tweak knobs to get the different amp voicings. If you are patient and want a more personalized tone, you'll appreciate deep controls better, but if you just want a plug-and-play amp with some versatility then you're better off with regular digital amp modeling. Having the ability to connect to a PA system via DI out is a nice plus, especially if you're looking to use your amp on stage. USB connectivity is another important feature, as it allows for easy recording and removes the need for amp miking or for an audio-interface. Those who want to practice quietly with their favorite tracks should look for headphones out and aux in ports. Interestingly, there are now Bluetooth compatible amps on the market, which allows for convenient wireless playback of your favorite tracks. There's no point in buying a full featured modeling amplifier that ends up gathering dust in your room because you're tired of hauling it around. So you'll have to balance features over portability, get one that is reasonably light considering your needs, while having enough volume and the features that you really need. For this reason, we've included the weight of all the amplifiers in the list. Before we did the research, we decided to stick with what most users will probably buy, which are combo amplifiers that are priced under $1000. Even with this limitation, we still ended up looking at more than 50 amps, and eventually gathering data for almost 30 of them. The said data are comprised of over 3,000 relevant reviews, ratings and forum discussions, gathered from both end users and experts. These data were then fed to the Gearank Algorithm, which gave us the scores that we used to rank each one according to three specific price brackets - which is sub $200, Sub $500 and Sub $1000. For more information about this process see How Gearank Works. Submitted by Jason Horton on Oct. 12, 2017. 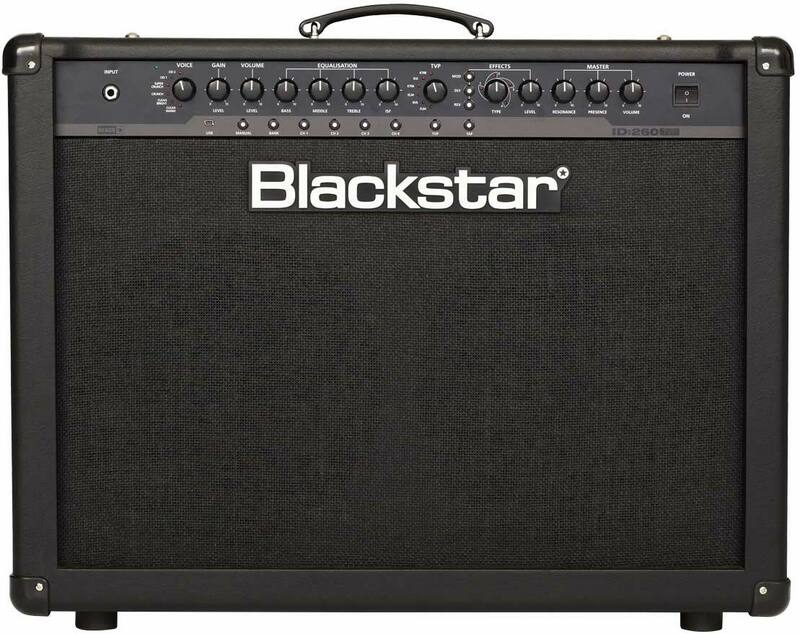 We have removed one of the amps from our recommended list due to a lack of availability but you can still read about it: Blackstar HT Stage 60. Submitted by Luca (not verified) on Sep. 24, 2018. The Line 6 amp is not a modeling amp in any way. Submitted by Jason Horton on Sep. 25, 2018. There are currently 2 Line 6 amps listed above. The Spider Jam has 12 amp models and the DT25-112 which has 4 'voicings' - both amps do this using Line 6's HD modeling technology from their POD HD.